The story of Chris Otule’s recruitment involves a bowl of Buffalo wings, a pair of “Kareem Abdul-Jabbar goggles,” one of the best-kept secrets in recruiting history and a promise an assistant made to a kid who, after meeting him for the first time, told him he sucked at basketball. 45 minutes after the Golden Eagles move within one-half game of Georgetown in the Big East standings, Chris Otule lumbers out of Marquette’s locker room. He holds a water bottle in one hand and has a backpack on over his sweatshirt and sweatpants. He’s exhausted after a four-rebound, one-block effort in 17 hard-earned minutes that felt more like 37. If this is the end of the road for Otule, he’s going out with a bang. A career 4.5-point, 3.2-rebound per game center, he’s averaging 6.3 points on 78 percent shooting and 3.8 rebounds over his last six games. 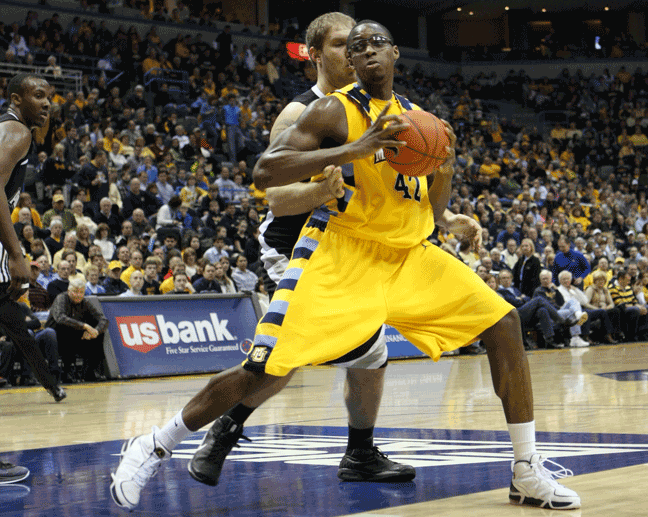 Chris Otule almost never got his start at Marquette. The redshirt senior still isn’t sure if he has just played his second-to-last home game in a Marquette uniform. His decision on a sixth season — one the NCAA has already granted — will come later. For now it’s about winning games. Otule almost saw those unseen endings to his collegiate career: a broken foot his freshman year, another broken foot his sophomore year, a torn ACL his junior year and a redshirt season to boot. “The end” could have happened multiple times, but the way “the start” happened is beyond incredible. Colorado State assistant coach Buzz Williams is outside his comfort zone. He hates bars. He can’t stand nightclubs. He doesn’t drink. Yet here he is, at the Final Four, surrounded by each and every one of those venues. As part of his annual routine to meet with as many coaches as he can — the same coaches he writes a letter to every week — Williams reluctantly agrees to meet up at Hooters with one of his coaching pals. It’s there that he runs into Ronnie Courtney, then-head coach at Texas Southern. Courtney, also in town for the Final Four, is with his entire coaching staff enjoying a bowl of Hooters wings. One Division I coaching staff. One small round of Buffalo wings. That tab at Hooters, another place Williams says he doesn’t care for, forms a relationship between the two on both a coaching and personal level. When Williams is hired as an assistant at Texas A&M, he doesn’t hesitate to agree to a “guarantee game” against Courtney and the Tigers. The two stay in touch, and when Courtney is let go in the summer of 2007, he finds work at Bush High School in Houston. The school hires Courtney to become a physical education teacher and the head coach of the boys varsity basketball program. On that team is an unproductive yet large-framed center. 17-year-old Chris Otule is nervous to take the floor. He’s done this plenty of times before, but today marks the first time in his basketball career he’ll participate in an open gym setting with Division I coaches there to see him. He averaged 5.0 points and 7.5 rebounds as a junior — much better than his 2.0 points per game on the junior-varsity the year before — to attract those assistants. Otule performs “OK” during the session, dunking a few balls, blocking a few shots and running the floor well. But he knew he wasn’t at his best. “I didn’t play how I usually play because I was nervous, obviously,” Otule said. The schools represented in the stands by assistants and head coaches include Baylor, Nebraska, Rice and others. One of those other coaches is newly appointed Marquette assistant Buzz Williams. After being added to Tom Crean’s coaching staff, Williams received a phone call that September from Courtney, who tells him “everybody” is recruiting this center on his team — the team Courtney has been a part of for three short months — Chris Otule. He asks Williams to come see the kid. And what Otule called an “OK” open gym session, Williams was less forgiving. Courtney saves face after Williams tell him what he thinks about Otule (“he’s not any good”), saying all he wanted was for Williams to come see Otule play. But instead of leaving, Williams — thanks to his relationship with Courtney — agrees to meet with Otule after the open gym session. There are two versions of the first time the two ever spoke to each other. It’s June 2008, and the usually reserved Otule, who Williams says never spoke on the phone for more than three minutes or gave more than one-word answers, is rather chatty the week before he’s set to arrive at Marquette. The “big guy” Marquette needed winds up being Otule, as Williams swoops in and “backdoors everyone” to receive a commitment from the senior who averages 14.2 points, 9.5 rebounds and 6.3 blocks. Otule considers Nebraska, Rice and Baylor, but an official visit that includes taking in a Bucks-Bulls game with Williams and Wesley Matthews seals the deal. Will Marquette give him goggles? He also needs to know if Marquette will hook him up with a pair of glasses. 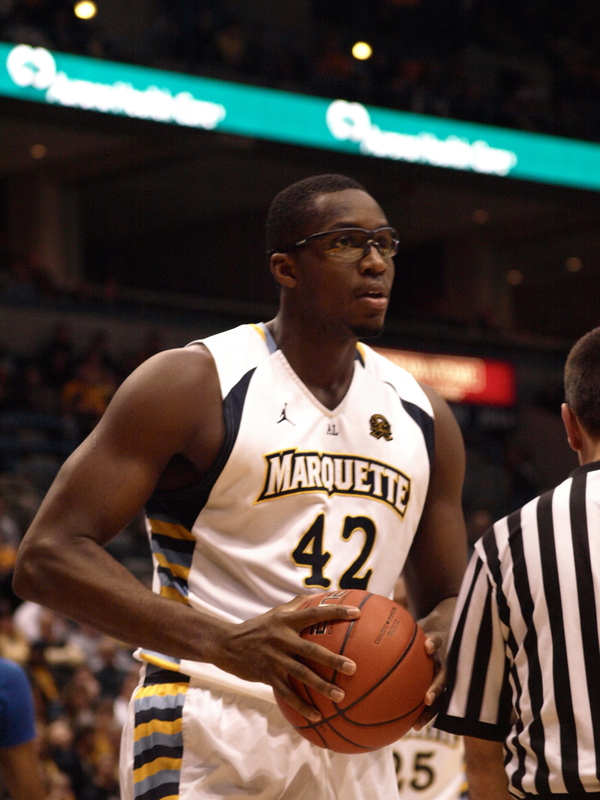 Williams repeatedly tells Otule that, yes, Converse-sponsored Marquette will give him goggles and glasses to wear. This is all new to him. He’s learning as he goes. Otule admits not really knowing what it meant when Marquette offered him a scholarship, and Williams explains that everything Otule — today a seasoned veteran — has learned about basketball happened the day he arrived on campus and beyond. So with Otule pestering Williams for the third straight day, wondering when those goggles and glasses will be available for him, the first-year head coach finally gives in. The day finally arrives. Otule joins the Marquette basketball team and, as promised, Eugene takes the freshman center to the eye doctor. When they return, Eugene heads straight for Williams’ office. “What are you talking about?” Williams asks Eugene, still not fully comprehending the bizarre situation. “Coach, he has a glass eye,” Eugene answers back. Otule was born with one eye, saying in an interview during his third season that his other eye was not fully developed, so he had an artificial left eye put in. He has the fake eye replaced when he grows out of the current one. He says that, outside of quick passes from short distances, the depth perception does not cause him too many issues because he has had it his whole life. Otule may not have had issues with it, but Williams initially did. The first phone call Williams makes it to Courtney. And in a somewhat heated, one-sided conversation, Williams presumes Courtney knew about Otule’s condition and never mentioned it to help Otule’s stock. But here’s the catch: Courtney never knew, either. Buzz Williams trusted Chris Otule, and Chris Otule trusted Buzz Williams. The results have been stunning. Otule, the same player Williams said sucked and was given a scholarship because Marquette “needed a big guy,” went through his whole recruiting process and senior year of basketball without any coaches knowing he had one eye. But Williams doesn’t end Otule’s story here. He agrees to continue on with his one-eyed freshman, trusting that he can keep up with the rigors of the Big East and Williams’ own practices and workouts with half the vision of everyone else. Williams’ trust in Otule mirrored the exact trust Otule had in Williams just months earlier, when the Marquette coaching staff was completely shaken up. Otule is just a month away from senior graduation when he returns home from school to boatloads of text messages. His soon-to-be head coach, Tom Crean, is leaving Marquette for Indiana. Not fully understanding what that meant for his scholarship, his future at Marquette or future in Division I basketball, Otule receives a phone call shortly thereafter from a friendly voice: lead recruiter Buzz Williams. As fellow 2008 recruits Tyshawn Taylor and Nick Williams and freshman Scott Christopherson bow out after hearing the news of Crean’s departure, Otule stands firm on his commitment to Marquette. Not once did Otule, who was being recruited heavily by the time of his commitment to the Golden Eagles, waver on his decision. He never checked out other schools. He didn’t want out. He trusted Williams because he was never given a reason not to. He wanted to stay. When Williams was named head coach shortly after Crean left, he called Otule. But this time the high school senior did the talking. Otule isn’t sure if this year is his last at Marquette. He doesn’t have any preparations to be honored Saturday on Senior Night. He doesn’t want to worry about it and doesn’t want to give off the wrong impression. Williams has already made public that Otule has a spot on next year’s roster — which will have to be trimmed by one to remain at 13 scholarships — if he chooses, but for now the fifth-year senior is enjoying his ride alongside Williams, the coach who learned to believe in him despite all his setbacks. “If I was at a different school and had been hurt as many times as I have been, I feel like coaches would just tell me to go and sit on the end of the bench,” Otule said. “But Buzz continued to have faith in me and I continued to work hard no matter what the hardships were. Fantastic article about a classy young man. Just another reason to be a Golden Eagle fan. They get more out of their talent than any team in the country.